Recently the WELS Locator application was rewritten and enveloped into the existing WELS Online Yearbook. The yearbook has slowly been updated with functions and data to make it a viable replacement for it’s paper sibling. You can search for a called workers name or city and receive a listing of those that match. Clicking on a called worker will reveal a profile that shows contact information, year graduated and what organization they work for. Where things get even more interesting is on the organization tab. For some time you could search for a church or school by name and/or city. 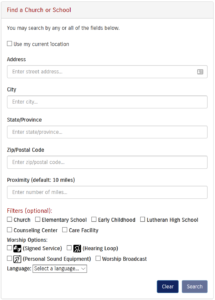 With the inclusion of locator functionality, you can now find a church or school by proximity to criteria you enter. You can enter an address, city, state or zip code and find all organizations within a radius of miles you determine. You may also select the option to find your current location as the search criteria…great if you are traveling and want to find nearby churches. Also available within the locator is a function to filter your search results by special criteria including Church, Pre-School, Elementary School, High School, Counseling Center and Care Facility. You can get even more filters related specifically to worship like Signed Services, Hearing Loop, Personal Sound Equipment, Livestreaming, and Languages Offered. There are a number of ways to find the Yearbook/Locator. You can simply visit the synod’s website at www.wels.net and click on the “Find a Church/School” (formerly “WELS Locator”) at the top of the page. This will take the visitor directly to the Organization tab of the yearbook app. You may also visit the Yearbook site directly at https://yearbook.wels.net, or the Locator portion at https://locator.wels.net. Finally, if you use the WELS Mobile app you can find a link to the Locator in the side menu or the Yearbook itself under the Synod Reports area. The Yearbook with locator functionality is a useful tool to get in touch with any called worker. Perhaps you have a friend or neighbor moving out of town and you want to contact the local pastor to get in touch. Simply search for a city in either the People or Organization tab and then reach out to that church or pastor directly to let them know that their might be a family to be in touch with. You could also share the information with your friend. Studies have shown that if a new resident doesn’t get “connected” with a church in the first 90 days, it is far less likely they will find a church home at all. With the locator functionality you could also pinpoint the nearest church or school to a specific address if you know it. Obviously if you are moving, this would be a great way to determine the proximity of the closest church or school. If you or someone you know needs to take advantage of special services offered like signed services, or hearing equipment, those filters are available. You can even find the closest services offered in Spanish or whatever other language is needed. And of course with vacation season just around the corner the Yearbook’s locator function will be a great way to find a service close to wherever you are, plus directions with the click of a single button. It is important to stay connected with a church family. The WELS Yearbook with Locator helps you, or those you know, do that. One related resource that was mentioned above is the WELS Mobile app. It has links to the Yearbook, but also great devotional content like Daily Devotions, Bible Readings, Worship Helps and a technology-in-ministry podcast called WELSTech. Just search for “WELS Mobile” in your favorite app store. Here’s a brief demo of some of the Yearbook and Locator functionality.